We are pleased to announce that we will have discipleship classes on prayer. These classes will cover all aspects of prayer starting from the very beginning and going to an advanced level. These prayer classes will be hosted in Blog Talk Radio at www.blogtalkradio.com/missionariesofprayer You can join us for a live session or listen to the classes later. Many Christians have never been discipled in prayer. There are very few training classes in prayer. 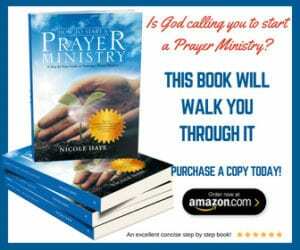 We listen to a lot of sermons on prayer but have you ever been trained? These classes are for you. Don’t assume because you have been a Christian for a long time that you know. Sometimes we pick up bad habits from others and we don’t have a scriptural foundation for the things we say in prayer. These classes are unique in that they will be done in a talk show format. We will have the teaching, we will pray and then you will have the opportunity to ask questions. These training sessions will be taught by various intercessors, pastors, priests, rabbis, elders and other church leaders. If there is a topic that you would like to know more about in prayer, please send us an email and we will add it to our schedule.